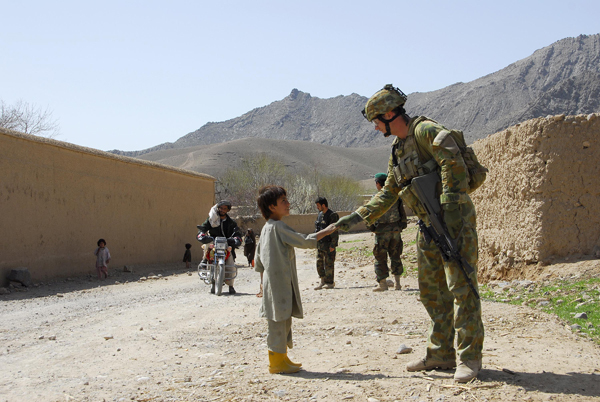 Lance Corporal James Kahika from the First Mentoring Task Force shakes hands with an Afghan child in the Baluchi Valley. Commanding Officer of the First Mentoring Task Force, Lieutenant Colonel Jason Blain got a clearer understanding of community perspectives after meeting local representatives during the Community Development Council (CDC) meeting in Sajawul, north of Tarin Kowt. The CDC meetings, locally known as a shuras, are opportunities for the people to discuss issues relevant to their community. They are also an opportunity for Australian and Afghan leadership to get a better understanding of community sentiment towards ISAF presence in the area. Over 30 locals discussed security and development matters at the latest shura, which was held on-site at a school development project in the Baluchi Valley Region. During the shura, LTCOL Blain announced that funding has now been made available to complete the school, which was very well received by community representatives. A key outcome of the meeting was community desire for a safer community where children have a secure place to attend school and receive basic health care. Things we take for granted in Australia. Operation SLIPPER is Australia’s military contribution to the international campaign against terrorism, piracy and improving maritime security. Under this operation our forces contribute to the efforts of the North Atlantic Treaty Organisation (NATO) – led International Security Assistance Force (ISAF) in Afghanistan. ISAF seeks to bring security, stability and prosperity to Afghanistan and aims to prevent Afghanistan again becoming a safe haven for international terrorists. Operation SLIPPER also supports the United States led International Coalition Against Terrorism (ICAT) in the broader Middle East.